VMware Dallas — Valerio Dewalt Train Associates, Inc. This project doubles the footprint for VMware, a fast-growing technology company, in the Dallas area. This office is located in a building that was designed to provide office space consisting of small enclosed offices and large seas of cubicles. 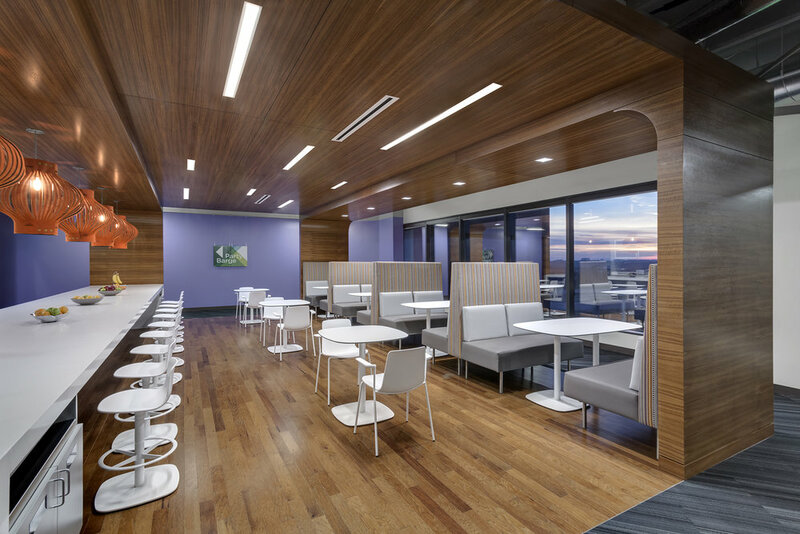 The challenge was to create an intimate, human oriented workplace within this framework. In order to create enticing, effectively sized areas for working, the floor is carved into a series of neighborhoods based on function. To keep the scale functional, and to encourage movement and connections between neighborhoods, the open office areas are integrated between the shared program elements. The connection and circulation spaces are identified and collected via an implied tunnel. The implied tunnel is carved and folded open to create an activated circulation path that bridges the various neighborhoods and zones. The tunnel’s walls are perforated using an algorithm that is unique to each neighborhood. The pattern of the perforations acts as a wayfinding device while the perforated walls strategically screen the inhabitants. The “Lunch Box” (break area) is situated to become the center of the space once the second phase is completed and our client occupies the entire floor of the building. The space was occupied in October of 2014.